Solid System Cabinets - Equipto Electronics, Corp. The Challenger enclosure offers economy, versatility, modularity and size selection. Solid System is our most economical line of vertical frame and sloped front consoles. The product features a “solid”, non-removable side panel. This “Solid Side” offers a cost saving and increases the strength of the cabinet. In all other respects, these cabinets are identical to the Challenger line so all the Challenger accessories are available without modification. When a low cost cabinet is required, consider Solid Side. The Challenger product line is available in vertical racks, sloped front consoles (15 degree), double slope consoles (30 and 45 degree), low profile frames and bench top racks. It has been value engineered to incorporate quality, performance and interchangeability. Features of this line include all welded construction to minimize twist, sway or deflection. 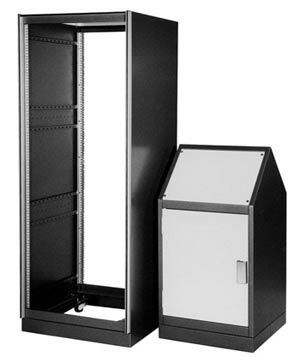 Universal side panels that can either be securely fastened from inside the cabinet to prevent tampering, or easily removed externally utilizing their lift-off feature. Flush or face mount doors (flush mount doors have lift-off hinges). Additionally, the doors have positive latching hardware, not magnetic or velcro stripping, as a standard feature. Many of the Challenger racks are also available in our Solid Side product line. Challenger and Solid Side racks are identical in all but one respect; solid sides in place of open frame construction. When removable side panels are not required, the Solid Side rack is a more economical choice. Solid Side racks are available in vertical racks, sloped front consoles (15 degree), double slope consoles (30 and 45 degree) and bench top racks. Additionally, all the accessories from the Challenger line are compatible with the Solid Side line.